The AWEX EMI closed on 1963c – down 20c at auction sales in Australia this week. Demand appeared slightly weaker as exporters are still discovering a commercial level for the diminishing quality of the offerings, however whilst the AUD price for wool, cheaper in USD terms, the AWEX EMI gained 5c. As a result of the lower price base, 10.3% of the 43,129 bale offering was passed in. Merino Fleece suffered under the highest volume of low style lots since 2010 and, as it has been mentioned before, the selection of best measured lots were fully firm whilst the average and poor style and measured fleece lots finer than 17.5 had the largest falls (-25c) with lots coarser than 17.5 least affected (down 5-15c). There was a noticeable resurgence of exporter interest for the best pre-shorn fleece wools which have been suffering under the pressure of increased quantity. Merino Skirtings followed the fleece trend with the best measured and style lots with VM under 3% attracting keen competition, conversely lots containing more than 5% VM attracting hefty discounts. In past weeks, the convergence of price between the low style, poorly measured fleece and the skirtings begged the question of what would happen when the fleece was the same price as the skirtings – we now have the answer, and unfortunately it is at the expense of the skirting category. Crossbreds defied the rest of the market and held firm on previous week’s prices whilst the Carding sector also gapped down an average of 52c across the three selling centres. 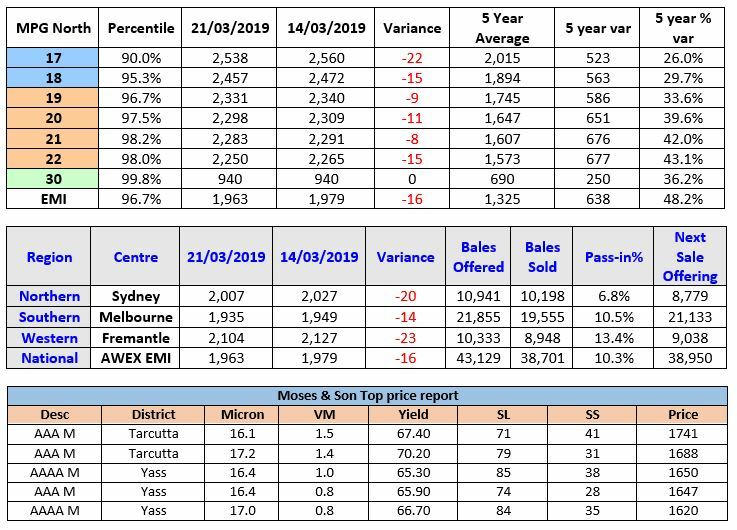 Forward Price Report from Michael Avery (Southern Aurora Wool): The week started firmly with reports of modest demand following last week’s retraction in prices. Buyers grabbed nearby cover at small discounts to cash. The forward market gap between bid and offer widened as growers stuck firmly to cash levels out to June. Buyers unable to attract offshore business at these levels are bidding conservatively. Early indications of the market finding a base were squashed Thursday as the market continued its downward trajectory from Mid-February highs. Both the spot and forward markets were hampered by a stronger AUD. The market drivers remain unchanged with balance between tight supply and sluggish demand the key to medium term direction. Risk remains high along the pipeline. The challenge for all participants is the establishment of fair forward values. Growers faced with conflicting factors. Firstly, a price trend that clearly, with the benefit of hindsight, debunked the forward discount that has been in place over the last few years. Opposed to that are the outright price levels forward. Although historically high and representing sound margin management does it represent fair value? In this high-risk landscape, some insurance and certainty are important. Forward levels from the exporters will be guided by the processors and their anticipation of the degree of demand destruction bought on higher prices coupled with embedded costs of running machinery and building stocks. SAW expect next week to track in similar fashion with any demand interest likely to be reflected in better bidding in the forwards. Volatility in this tight supply environment the likely constant. Commentary: Next week’s offering of 38,950 bales will face the same challenges with the ever increasing percentage of drought affected wool across the eastern sea board. Michael Avery has captured a balanced picture of what the factors are at this minute. Wool production remains at historic lows and will also most certainly stay low for 2 years or more with reports of poor scanning results and silos and haystacks as we move into the early sowing period for winter feed crops with little moisture (I’m currently watching the skies as they darken and storms look promising). From this important time, I see great opportunity in retaining sheep or even purchasing sheep and feed to carry them. Whilst there is some risk in this strategy, there is equal risk in selling down and then expecting to buy back in when “things return to normal”. It totally depends on your appetite for risk and where you want to be placed this time next year hopefully enjoying high prices for wool and sheep meats.